No. You are not multi-tasking. Just distracted. In Lean thinking, any steps in a business process that adds no customer value is considered as a waste. Continuously monitoring wastes in the process and eliminating them is the heart of Lean project management. In Craig Larman's book, Scaling Lean & Agile Development: Thinking and Organizational Tools for Large-Scale Scrum , he listed 10 types of Non-Value-Adding actions (*). Task switching, motion between tasks, or interrupt-based multi-tasking is one of the 10 NVA types. Scrum emphasizes that the team should focus on implementing one feature at a time, and avoid multi tasking. Your Brain on Computers - Attached to Technology and Paying a Price - NYTimes.com Scientists say juggling e-mail, phone calls and other incoming information can change how people think and behave. They say our ability to focus is being undermined by bursts of information. These play to a primitive impulse to respond to immediate opportunities and threats. The stimulation provokes excitement — a dopamine squirt — that researchers say can be addictive. In its absence, people feel bored. The resulting distractions can have deadly consequences, as when cellphone-wielding drivers and train engineers cause wrecks. And for millions of people like Mr. Campbell, these urges can inflict nicks and cuts on creativity and deep thought, interrupting work and family life. 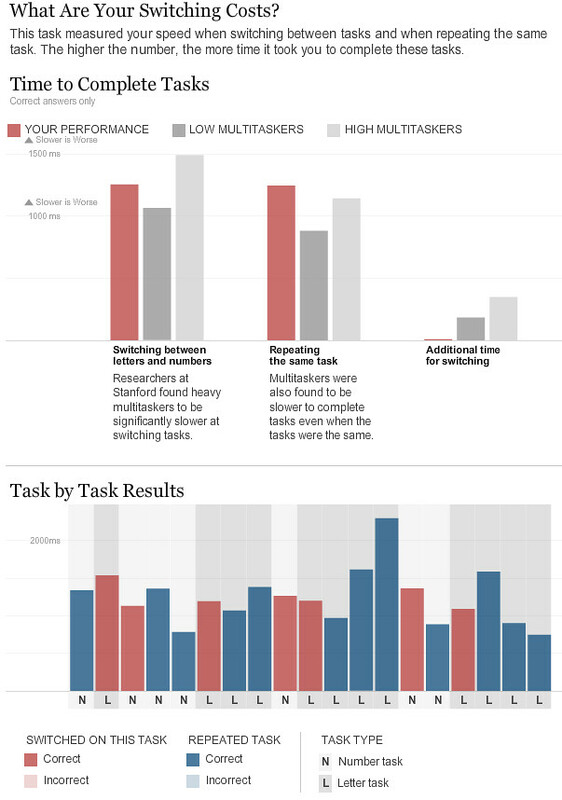 While many people say multitasking makes them more productive, research shows otherwise. 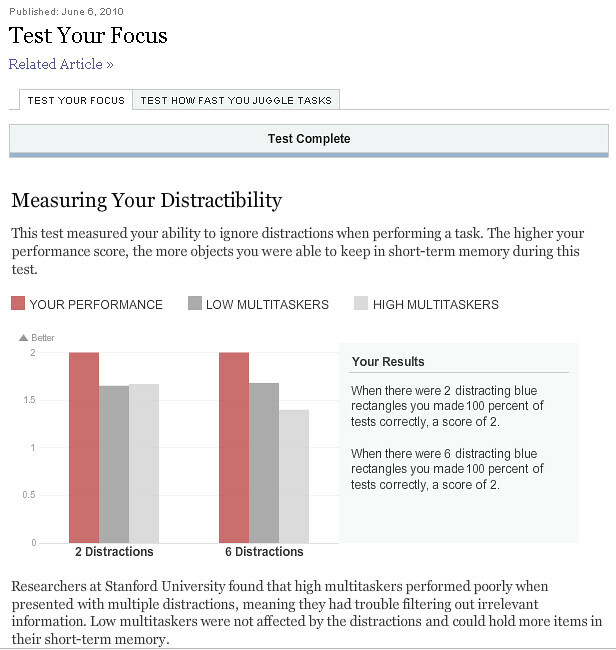 Heavy multitaskers actually have more trouble focusing and shutting out irrelevant information, scientists say, and they experience more stress. 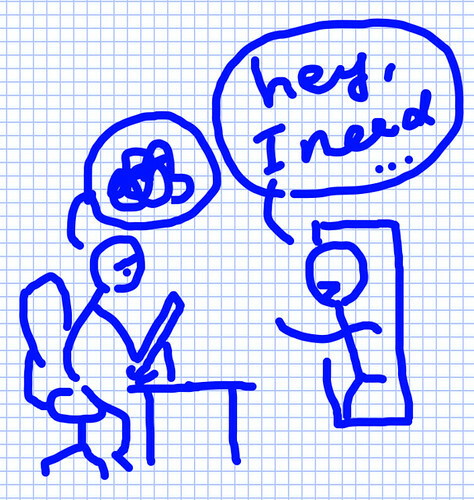 I work in an office environment where the user of our software library can casually walk in, and start asking questions or immediate supports. Playing a nice person (or being heroic to others) is a source of the multi-tasking death spiral, and such situations are indeed happening daily. Every time I stopwhat I do and I walk out the room to help others, my brain are forced to switch from one thought process to the other. Cost of switching the task eventually chokes my brain. Although the test attached to the NYT post showed that I may be a good at switching tasks (**), switching tasks always has a positive cost to everybody, and no body's brain is free from the stress associated to it. Scrum principle tells the team member not to deviate from Sprint backlog during the Sprint activity. Any request from clients should first go to the product owner so he or she evaluates the business value first. While the principle make a lot of sense, I also feel very sorry if I have to say, "I am busy and I cannot help you on the matter off the backlog." Saying so is even bigger stress for me, and I believe I am not alone. What is a wisdom to avoid such stresses and to maintain the positive and productive mood? Scrum encourages team members to care each other, and encourages that the entire team together take on one feature at a time. I think this is the key to avoid multi-tasking, too: I recently started to take a moment to ask other team members' opinion on my diverting from the backlog item whenever I got requests off the backlog. By doing so, I am ensuring that the request, even if the team eventually gives higher priority than the existing backlog items and decide to pursue it, is no longer tied just to me personally, but it is now the entire team's concern. Now that the entire team has a stake on the request, and it is much easier to say no if we need to. It is less stressful that way, and this practice helps us not to deviate from the backlog. We have better chance of focusing one task at a time. Note that I'm not a native English speaker and it generally took longer time for me to distinguish vowels/consonants and associating even/odd numbers with English terms. I think what we should focus here is the additional cost from repeating tasks to switching task tests. The right most graphs. Here, the additional cost by my performance is lower compared to high multi taskers.